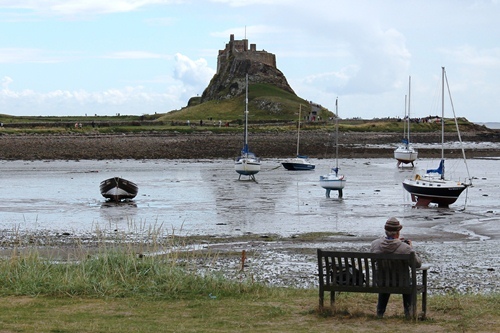 Just outside the Priory museum on Lindisfarne, there is a plaque dedicated to the lifeboat teams of the island and their rescues. 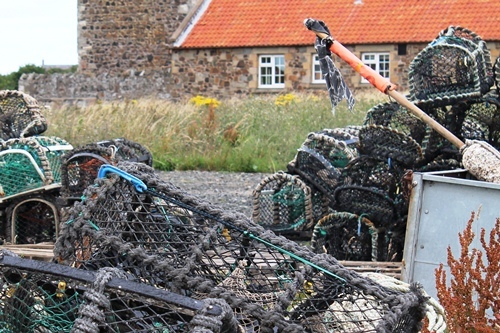 The first recorded was in 1867, by the lifeboat Grace Darling – a name we will hear time and again during our trip to Northumbria – and the rescue of four lives from the fishing coble of Holy Island on April 29th. The final rescue, before the lifeboats of Holy Island were withdrawn from service, was in 1954 by the Gertrude, with 11 lives saved. On the day we visited in August it was drizzly but the seas were calm… however, looking out across the North Sea from the lookout tower along the coast south to Bamburgh, and the Farne Island lying low offshore, it was not difficult to imagine the sea violent and transformed, crashing boats against the rocks and then the bravery of those lifeboat teams as they pushed themselves out into the squall. There are more memorials, from the gravestones of the churchyard to the solemn granite column dedicated to those of the island who gave their lives in the two World Wars, and whose names look down on both the village and the bay, where seals pop their heads out above the waves. From the cliff above the Priory we can see across the harbor to the footpath leading up to the castle, standing high on its rock like something out of a particularly fanciful film. Along the path walk a trail of people, making steady progress past the ice cream and chip vans. We drop down past the harbor, where upturned boats have been converted into storage sheds, and join the throng. We hear German and French, plus some languages we cannot decipher. 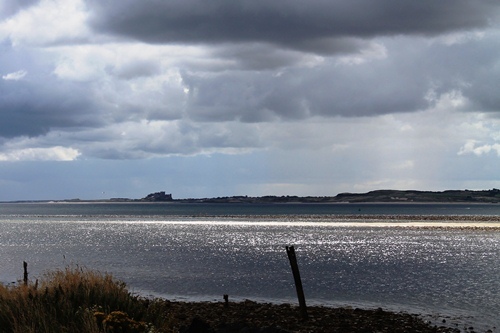 For centuries people have been making a pilgrimage to Lindisfarne, walking across the sands at low tide to this cradle of English Christianity, and still they come, only now they are more likely to drive the causeway than brave the sands, and come armed with a National Trust membership card rather than a battered copy of the Bible. At the foot of the castle we duck out and walk around towards the sea, and now we have the place pretty much to ourselves. 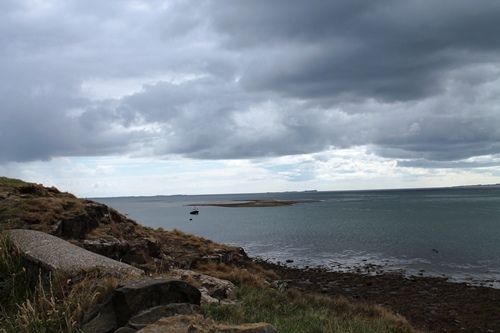 A couple of others have also broken free from the stream heading to and from the castle, and we explore the foot of the walls and the old lime kilns, picking our way across the headland for a view of the North Sea. Now it was possible to imagine the desolate beauty that must be available on a Tuesday morning in February, when the seas are angrier and the winds more violent, and we make loose promises to return. But ever since we parked up on the edge of the village we have been conscious of the time. 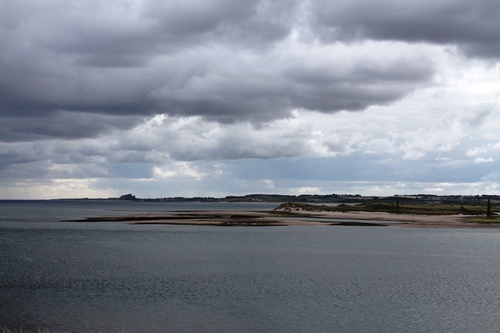 We want to get back across the causeway to the mainland before the tide rolls in and strands us on Lindisfarne for five hours or more. So we head back to the track and push for home. This entry was posted in Places on September 8, 2013 by Paul Scraton. A welcome reminder of a visit to the island a couple of years ago. Similarly, not religious but couldn’t help but feel that this is a very special place and worthy of pilgrimage whatever your motives.. 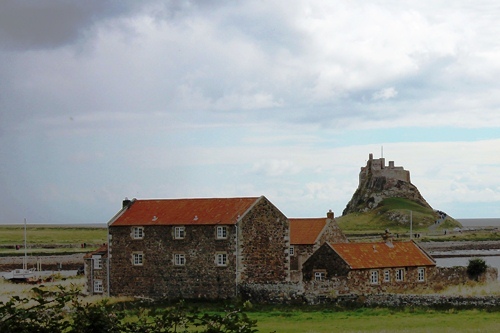 I was 14 when I first visited Lindisfarne … a day imprinted on my consciousness forever. We were a busload of seminarians at Ushaw College, Durham – perhaps Britain’s most celebrated seminary descended form Douai in France. We stopped at a religious house in Alnwick where lunch was served by nuns … a quick visit to the castle that was to be made famous decades later in Harry Potter films … and then to the majestic Bamburgh Castle and eventually to Lindisfarne We were heading to Lindisfarne where St Aidan founded its monastery in the 7th Century. In the year it was founded Cuthbert was born, later elevated to St Cuthbert and then the patron saint of Ushaw (St Cuthbert’s College, Ushaw). 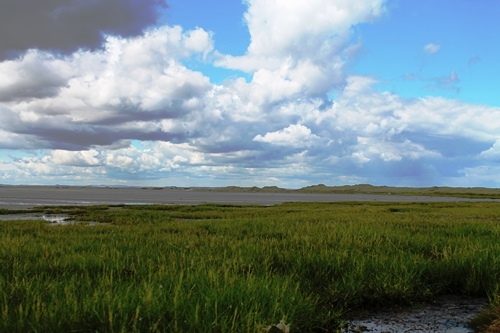 I loved Holy Island’s solitude, a true tidal island, a more majestic version of my childhood memories of Hilbre Island (River Dee). I vowed to return without the formality of an organised pilgrimage with its trappings of Gregorian chants and rosary beads. In 1966 I left Ushaw and its not-so-positive memories. 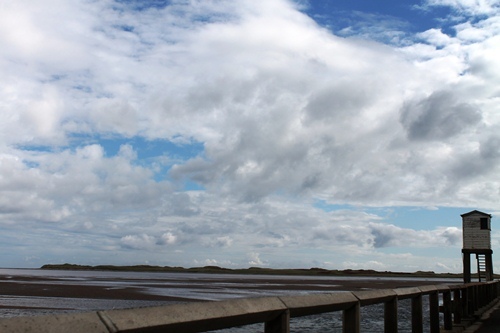 Back on Merseyside it was a memorable year … seeing the great Pele and Eusebio play for Brazil and Portugal at Goodison Park … and returning with a group of mates to the North East to camp at Thropton, near Rothbury and my last trip to Lindisfarne. These were defining moments as I crossed my personal Rubicon, eventually to lose the religion that had been my intended destiny and discover a ‘new life’ freed from the ‘das opium des volkes’ (the opium of the people)! Thanks Paul … your post brought it all back! Great post, that boat cabin picture at the start is a brilliant structure! I’d love to visit the island, you’ve captured the remoteness perfectly! 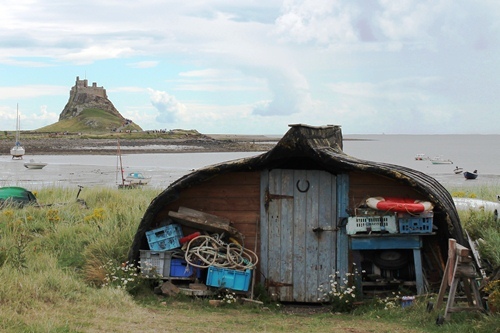 A spiritual and magical place – glad to know the boat hut is still there.